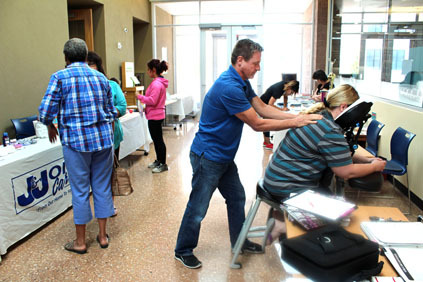 Rick Wiles of the Artesia Family Wellness Center gives a chair massage as Artesians peruse the Health and Wellness Fair Tuesday afternoon at the Artesia Public Library. The Health and Wellness Fair served as the kickoff to the library’s Summer Reading Program, which this year centers around a sports, fitness and wellness theme. Program events are published regularly in the Around Town section of the Daily Press.